Fires continue in the Middle East, with the war in Syria, and protests in many countries across the region over the past couple of weeks. Friday before last in Lebanon (the day of the attacks in Libya, and protests in Egypt) there was violence in the northern city of Tripoli, with attacks on Kentucky Fried Chicken and Hardee’s (a burger joint), as well as on a government building in that city. This past Friday the papers reported that tens of thousands were demonstrating in the Bekaa (eastern Lebanon), and a few thousand gathered in downtown Beirut at Martyr’s Square to protest the notorious film and comics. Coming from Latin America, protests certainly aren’t new to me. I remember a day that there were protests near the university in Tegucigalpa, Honduras, which I passed daily on my way to pick up the kids from school. I spotted a burning tire down the road. I did the sensible thing: I turned the car around, and found another route. When there’s fire – literal or figurative – I stay away, and I’ve kept well away from the protests in Lebanon. Fortunately, both of the demonstrations this past Friday were without violence. And although it may seem surreal, life went on as usual for most Beirutis, who simply avoided the demonstration in downtown Beirut and its associated traffic (the police had closed off nearby streets, turning the usual traffic into an ugly snarl). For me and my family, life as usual meant attending a school event, one that had been scheduled weeks in advance, but coincidentally fell on the same date and time as the protest: Chalk for Peace. So while protesters gathered in one part of the city, hundreds of school children were gathering in another, using chalk to write messages of peace and hope. But as I said, for most folks things are business as usual in this corner of the world, and the complicated life of Lebanon is peppered with more mundane issues, such as the new smoking ban. On September 3, 2012, Lebanon followed the likes of New York, San Francisco, Seattle, Argentina, Honduras and numerous other countries, and put into effect a ban on smoking in all enclosed bars, restaurants and cafés (completing a ban that began with public buildings and transportation). Individuals can be fined US$100 for violating the ban, while establishments can be fined US$1000 to US$4000 for allowing the ban to be violated on their property. We went out for dinner a night or two later, and found it a relief not to have to breathe in others’ smoke while eating. Also found it interesting that around 9pm, one of the waiters came through the establishment and placed ash trays on all the tables. Didn’t see anyone light up before we left though, maybe you need to stay out later than we do. According to local newspaper The Daily Star, “Smoking rates in Lebanon are among the highest in the world, with 42 percent of men and 27 percent of adult women smoking.” In addition to cigarettes, the Lebanese often smoke nargilehs (also known as arguileh, shisha or hookah pipes): water pipes that are heated with live coals, used to smoke fruit-flavored tobacco. 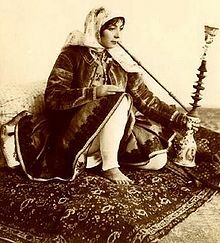 The water serves to cool the smoke, and establishments serving nargileh typically have one or more staff specially dedicated to bringing the tall pipe to your table, lighting it up (by smoking it a bit – and changing the mouthpiece before handing it over), and stopping by with more coals to keep the pipe going. Nargileh smoking seems especially popular with women, and in particular, with Muslim women. They are smoked at cafés and restaurants (now just those with outdoor seating), at the beach, I’ve also seen ladies sitting and smoking at the amusement park and at a waterslide park, while the children play. Despite its popularity, one of the people I met in my first couple of weeks here pronounced that “smoking one nargileh is the equivalent of smoking 40 cigarettes.” Couldn’t find anything to back up that stat online, but did find some other proclamations: “One nargileh pipe has 100 times the smoke as a cigarette.” “Because the tobacco is heated rather than burnt, there is less tar.” “The levels of carbon monoxide produced and absorbed is likely as much or more in a nargileh as in cigarettes.” (But how many cigarettes?) “A pipe has nicotine the equivalent of 10 cigarettes.” (But you don’t necessarily smoke the entire pipe’s worth.) Effects vary not only according to how long you’re smoking your pipe, but what type of pipe it is (they come in different shapes and sizes). The nebulous details lend themselves nicely to ignoring the effects of nargileh smoking, although clearly, anyone could agree that it’s harmful. But that’s not stopping an estimated one-third of high school students in Lebanon from lighting up a pipe (as opposed to an estimated 6% that smoke cigarettes). I’m all for supporting cultural practices, but when they’re harmful, a little legal determent can be a good thing. Attacks in Tripoli, protests in the Bekaa and Beirut – figuratively speaking, there are fires in Lebanon. But thankfully, no more smoke.